If you’ve decided to add a new member to your family and have adopted a cute little kitten you might be wondering considering purchasing a pet insurance policy, but you might also be wondering what you should feed him. You may be confused with all the choices you’re presented with. Do you need a kitten food or is a food that states “for all life stages” okay? Do you choose a wet food or a dry food? Should you choose natural or organic? With all the choices, feeding kittens can be more confusing than it needs to be. Kittens are energetic animals and burn large amounts of calories each day. They need to be fed a food that is specially formulated for kittens. 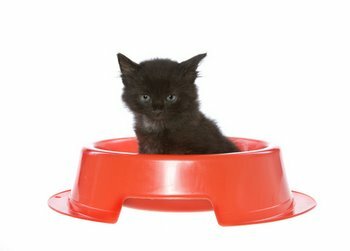 Kitten food provides higher amounts of protein for proper growth. Young kittens and those that are small can benefit from the additional nutrients in wet food. Kittens that are fed both wet and dry food should be fed twice a day. If only wet food is being fed, they should be fed four times a day. Kittens that eat dry food can be “free fed” until around four months of age. Free feeding means the kitten has free access to their food throughout the day. Once the kitten reaches four months of age, he should be switched to a scheduled feed twice a day. Kittens that are overweight should not be free fed. Wet food should not be left out for free feedings. Wet food becomes a breeding ground for bacteria and can make your kitten sick. Use separate bowls if feeding wet and dry food to keep the dry from being contaminated from the wet food. Opened cans of wet food should be kept in the refrigerator. Whether you choose to feed your cat wet or dry food, make sure to choose a quality natural or organic cat food. These foods offer higher quality ingredients that will help your cat live a healthy life.